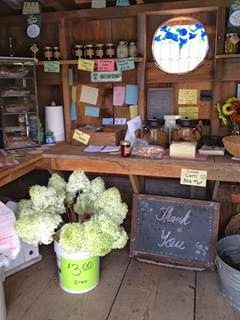 It's so easy to bypass a simple roadside stand when you're driving country roads. Even at those low speeds, you miss the subtle markers in scenery that brims with items demanding your attention. If I were walking or taking in Maine's pristine scenery from the seat of my bicycle, I would not have almost missed it the first time. But the word "PIES" displayed in bright pink chalk on a small blackboard beside a single lane road somehow stuck with me. My friend and I were in southern Maine for several days, not far from the New Hampshire border, when, one morning we had a craving for homemade pies. Where else to find 'em than Maine? Except we couldn't find any. Then I remembered the pink "PIES" sign on some road we passed the other day. My friend was skeptical. Did it really say "pies?" And, then I wondered if the pie would even be worth trying. 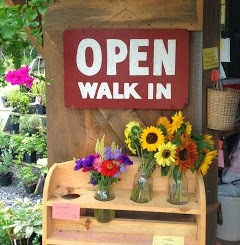 With thoughts of blueberry, apple, apricot and rhubarb pies twirling in our heads, we set off to look for this sign. And, curiously, after leaving our accommodation in Biddeford Pool, I spotted the sign as we zoomed by. I cried out "Pies." But we were already long past it. Was it worth making that U-turn? Yes! Beside the sign was a small driveway and a parking lot adjacent to a self-serve farm stand that was carefully decorated and stocked with homemade everything. Freshly baked pies were each stacked atop doilies and placed in a glass case. That day it was apple and blueberry. Shelves held jellies and jams, including several with habanero peppers. Lobster meat was stored in a cooler as was pesto sauce in little tupperware-type containers. There were chocolate chip cookies, just-cut flowers and so much more. Everything was done with great care. (Even a laughing Buddha was positioned near the entry.) Colorful post-its lined one wall, each to be used under different circumstances, including when the pies would be out of the oven. I found out that this is the owner's first year managing her farm stand. Given the quality of your goods -- we ate the entire pie in almost one sitting -- and her thoughtfulness, I'm confident her venture will be a success. I love finding stands like this one, by the side of the road. Glad you turned around! I love blueberry pie, too. A vivid memory well told, J. good to hear that you think she has a bright future, too. Hi Alexandra, I do more stopping at farm stands when I'm biking or hiking vs. when I'm driving around. I'm just glad we found this one among all the many roads we drove that week in Maine. Hi Kerry, Thanks so much. Yes, the owner sells her pies and other consumables at a farmers market also where I'm sure she talks up her farm stand.